Boy is it crazy windy out there today! Slept Pretty good last night/this morning. I did not go to bed until close to 2am, quiet house, scary movie and laundry to fold! I was watching the “Hills Have Eyes”, seriously, who is the mentally deranged person who makes movies like these? Even better yet, WHY do I watch them?!! Fell asleep with no issues and woke up shortly after noon. Good thing my kids are not infants anymore, I could never get away with a sleep schedule like that! Then again, who has a work schedule like mine? So, I should not get too much flack for it! Between last night and the day before I got some good solid sleep. Makes ALL the difference in the world. HUGE difference. However, it was probably a good 18 hours between the two days combined. So much time..I could be doing other more useful things! I especially can’t be doing that come spring/summer! I have outside dates to attend to! Either way, it sure feels good to NOT feel exhausted for a change. Too bad tomorrow I’m back to work for two days. Ahh, well. Today is today and today I feel good. 3 mile run on the treadmill 29 and change- took it slow and easy. Fine enough. Glad I did it! 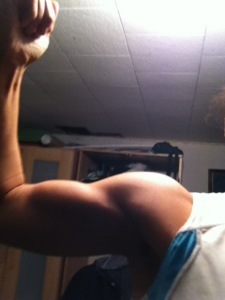 The First one is a more recent bicep picture. 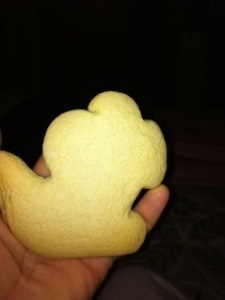 The 2nd one is the famous fat cookie I speak of! 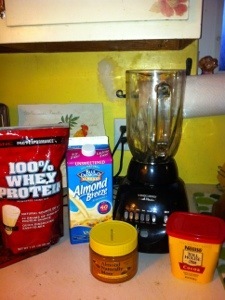 Then there is my ingredients for my favorite protein shake! Then the other are my favorite leafy greens! 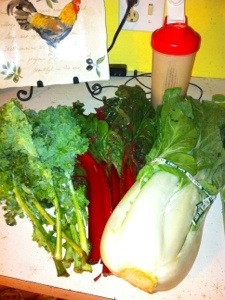 Kale, Bok Choy and Swiss Chard. 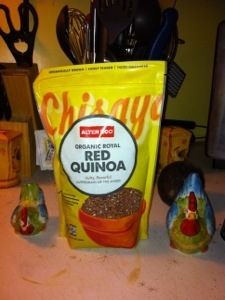 The last is Red Quinoa!